"Inspired" By Formspring, Tumblr Launches Nearly Identical "Ask Me"
Remember Formspring.me, the service we covered two days ago that makes it easy to conduct your own online Q&A with the web at large? Popular microblogging service Tumblr has just launched a new feature called “Ask Me” that does the exact same thing. The new feature is simple: if you have a Tumblr blog, you can now add a form that lets your readers ask you whatever they want. They can leave their questions anonymously or submit them alongside their account name. Then, you can pick and choose which questions you want to answer and post your responses to your blog. All is not lost for Formspring.me, though. CEO Ade Olonoh says that while Tumblr served as a good incubator for Formspring.me, the service has since grown well beyond that site. 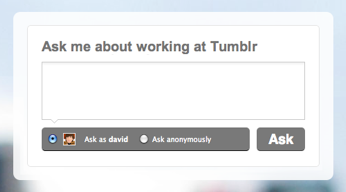 He says that in the past few days only around 3-4% of questions answered on Formspring.me were syndicated to Tumblr. I suspect those figures are skewed by the fact that Formspring.me has been covered by a number of large tech blogs recently, but the appeal of these Q&A services clearly extends beyond Tumblr. Tumblr hasn’t exactly shied away from ripping off other sites before. Back in August the site launched a StumbleUpon-like toolbar called TumblUpon (seriously).